Der Artikel Forma: Semblance wurde in den Warenkorb gelegt. 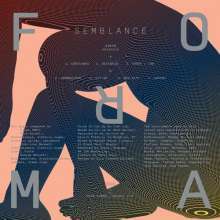 Brooklyn trio Forma's latest LP continues their mission to »broaden the idea of what an electronic music ensemble can sound like.« Semblance emerged from exploratory sessions at The Schoolhouse, the Bushwick loft where members Mark Dwinell and John Also Bennett live, then was tracked at Gary's Electric studios, where their previous album Physicalist was also recorded. Inspired by polyrhythmic composition, the human voice, and conceptual improvisation strategies, the songs are striking in their textural detail and emotional nuance, alternately synthetic and sentient, futuristic and intuitive. Incorporating flute, piano, guitar, saxophone, acoustic drums and cymbals alongside an array of synthesizers, the record persuasively demonstrates the group's unique playing abilities and fluid chemistry – attributes they credit to »techniques we've developed to trick our electronic machines into mimicking the spontaneous character of live instruments.« Members George and John Also Bennett also cite as an influence their recent stint in minimalist composer Jon Gibson's ensemble, performing his 1973 proto-ambient masterwork Visitations. The long-form modal piece requires restraint and deep listening to execute, qualities especially apparent in the more muted moments of Semblance, such as »Rebreather« and »New City«. The group states the intent of the new album as »to be more direct and exacting«, which it is. Over half a decade spent writing and recording together has distilled Forma's hybrid electro-acoustic interplay into an attuned and astounding language, capable of articulating impossible symmetries and reflective states. The stunning visuals of the artwork are by frequent collaborator of the group Peter Burr.